We have had a wet morning here in Michigan – 1.23 inches of rain thus far here in Otsego with a temp of 46° at 7am. We have covered a wide range of weather information over the past couple weeks and yes there will be a test come Monday so be prepared (just kidding but I do expect the first draft of your thesis next week 🙄 ) My college days are long in the past and I can not say that I miss them much – I was a thirty eight year old in a class of youngsters, however that is a story for another time. We covered supercell types earlier and now it is time to study different thunderstorm types…. Often called “popcorn” convection, single-cell thunderstorms are small, brief, weak storms that grow and die within an hour or so. They are typically driven by heating on a summer afternoon. Single-cell storms may produce brief heavy rain and lightning. A multi-cell storm is a common, garden-variety thunderstorm in which new updrafts form along the leading edge of rain-cooled air (the gust front). Individual cells usually last 30 to 60 minutes, while the system as a whole may last for many hours. Multicell storms may produce hail, strong winds, brief tornadoes, and/or flooding. A squall line is a group of storms arranged in a line, often accompanied by “squalls” of high wind and heavy rain. 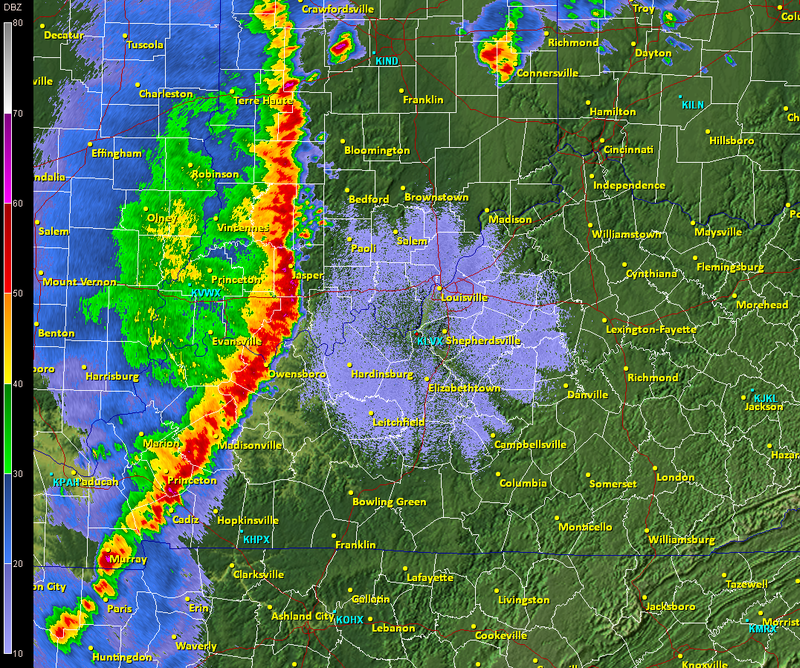 Squall lines tend to pass quickly and are less prone to produce tornadoes than are supercells. They can be hundreds of miles long but are typically only 10 or 20 miles wide. A supercell is a long-lived (greater than 1 hour) and highly organized storm feeding off an updraft (a rising current of air) that is tilted and rotating. 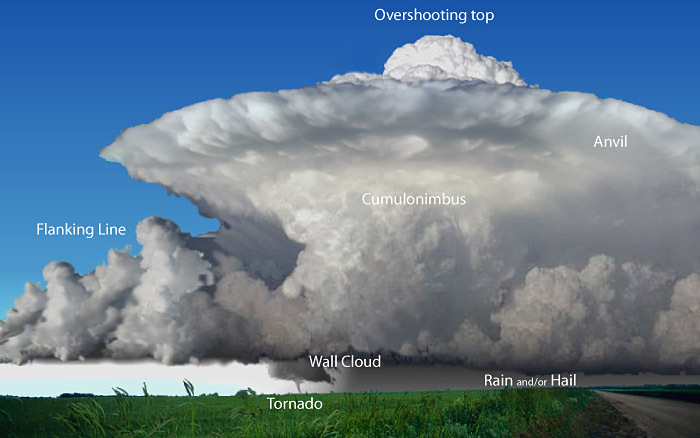 This rotating updraft – as large as 10 miles in diameter and up to 50,000 feet tall – can be present as much as 20 to 60 minutes before a tornado forms. Scientists call this rotation a mesocyclone when it is detected by Doppler radar. The tornado is a very small extension of this larger rotation. Most large and violent tornadoes come from supercells. Some of the features to be found in a supercell storm. Every storm is different. Not all storms will display all of the features of a classic supercell. A “bow echo” is a radar signature of a squall line that “bows out” as winds fall behind the line and circulations develop on either end. A strongly bowed echo may indicate high winds in the middle of the line, where the storms are moving forward most quickly. Brief tornadoes may occur on the leading edge of a bow echo. 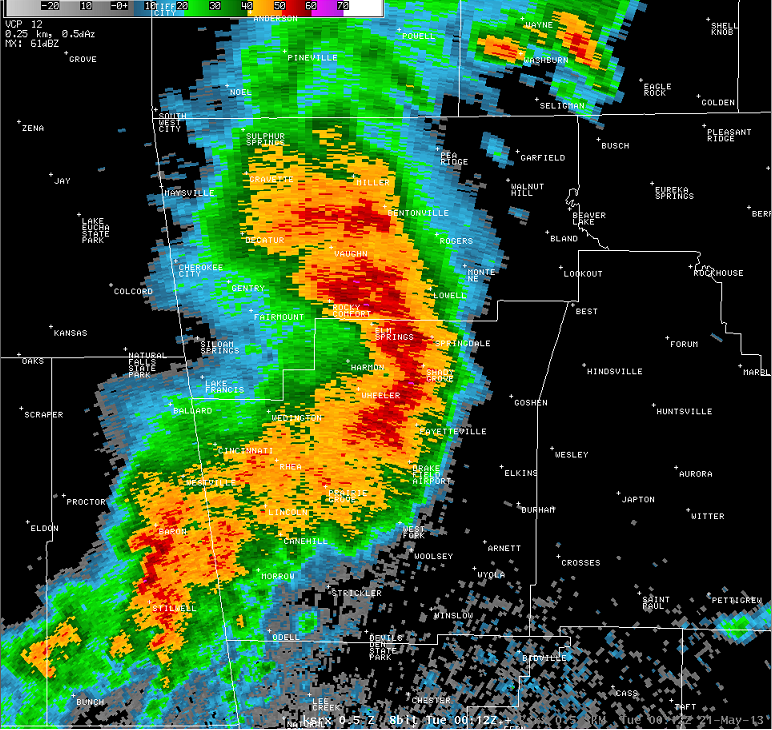 Often the north side of a bow echo becomes dominant over time, gradually evolving into a comma-shaped storm complex. Bow echo over Springdale, Arkansas, 21 May 2013. Typical evolution of (a) into a bow echo (b, c) and into a comma echo (d). Dashed line indicates axis of greatest potential for downbursts. Arrows indicate wind flow relative to the storm. Area C is most prone to supporting tornado development. Mesoscale convective complex (MCC)—A particular type of MCS, an MCC is a large, circular, long-lived cluster of showers and thunderstorms identified by satellite. It often emerges out of other storm types during the late-night and early-morning hours. MCCs can cover an entire state. Mesoscale convective vortex (MCV)—A low-pressure center within an MCS that pulls winds into a circling pattern, or vortex. With a core only 30 to 60 miles wide and 1 to 3 miles deep, an MCV is often overlooked in standard weather analyses. But an MCV can take on a life of its own, persisting for up to 12 hours after its parent MCS has dissipated. This orphaned MCV will sometimes then become the seed of the next thunderstorm outbreak. An MCV that moves into tropical waters, such as the Gulf of Mexico, can serve as the nucleus for a tropical storm or hurricane. A derecho (pronounced similar to “deh-REY-cho” in English) is a widespread, long-lived wind storm that is associated with a band of rapidly moving showers or thunderstorms. Although a derecho can produce destruction similar to that of tornadoes, the damage typically is directed in one direction along a relatively straight swath. As a result, the term “straight-line wind damage” sometimes is used to describe derecho damage. By definition, if the wind damage swath extends more than 240 miles (about 400 kilometers) and includes wind gusts of at least 58 mph (93 km/h) or greater along most of its length, then the event may be classified as a derecho. On a sad note my friend Charlie the possum passed away – he was an old fellow who made his way to our cat food bowl daily slowly but surely. His last journey he didn’t quite make it to the porch. RIP Charlie…. Great post MV. Sorry to hear about Charlie. This Spring we have a possum here that seems to like us. We have named her Petunia. Hopefully she will stick around awhile. She has quite the variety of bird and squirrel food available. The t-storm we had last night sure was loud! It poured really hard here. Cleared out and the sunshine came by noon. The wind was very blustery around here. Nice Spring day. One thing that I have noticed is how green the grass has become with the rain we have had. By April standards this could be a monster! Get ready for snow!!! You call 1 inch of snowfall a monster storm in December! You’re hopeless!! Just the facts baby! Rock n roll will never die! LOLOLOL!!! Yeah, lots of snow in this Forecast for next week!! Tons of snow with high temps in the mid-50’s to 60’s!! LOLLOLLOLLOLOLLOLO!!!!!! Check this out! Rock n roll will never die! Get ready for a possible snowstorm for the GGR area on Sunday and then more snow next week! What a winter and when will it ever end? So…..2 inches of snow is now a snow storm?? Get real!!! Get ready for 60’s starting Tuesday!! Winter’s been dead for weeks! Good day to fly a kite. LOL just a few weeks ago you said no 60’s or 70’s would be coming until May, and GR has seen 5 so far. Very typical Michigan spring. Matt Kirkwood just showed April 19th – 25th being much below normal temps in Michigan… Interesting…INDY! The sun is now out, I stepped out side and with the wind it feels very cool out there. The current temperature here is now at 49. Hey Rocky looking like another Winter weather Advisory coming Sunday stay tuned …INDY!! Bring it and forget a nice warm Spring! I want to ski again! Forget golf! There are golfers on our course this morning. A bit too cool for me today. If we did not have all the wind it’s turning out to be a beautiful day now sun is shining and the temp is now 53* degrees out at my work …INDY! You are correct INDY, they may need to hoist another WWA for Sunday! The winter that never ends!!!! More snow is in the forecast!!!!!!!! With so many states seeing huge amounts of snow and temperatures in the single digits and teens, I’m so glad we got rain and storms with this system! Poor Rocky lives in the wrong area. Waiting on them mid 60″s today …You said Friday right? Lol…44* degrees out at thee YARDofBRICKS NE GR…With that im thinking 4th below normal day in a roll..Have a super Weekend stay warm everyone…INDY! Nope. I said that WOOD raised their temps for Friday from the 40’s to the 50’s – which we should easily hit. MV great info as always. It sure was a loud storm and the drop sizes sounded liked they varied. I always get a little nervous when we get a quick min or 2 spurt and then silence and then it starts to rain hard again. That is a cool looking map! Here at my house I now have received 0.81” of rain. The temperature has now gone up to 44.6° here. With all of the rain in the last few days the grass is now turning more and more green and it will soon be time to make the first cut of 2019. The month of May is generally grass cutting month and it seams as if you have to cut the grass 3 times a week.